Definitely, more lambs than lions. Newborn lambs at President James Monroe's home near Charlottesville. The weather has certainly been lamb-like for the most part. We've heard about that on the news. Down in Charlottesville, Virginia, everything was exploding with flowers. I was there for the Virginia Festival of the Book--and what a great festival it is! Hundreds of authors in a historic and beautiful city. This is actually Reston, but you get the idea. This misty shot from the terraced gardens at Jefferson's Monticello was about as liony as we got. Some thunderstorms overnight, too. But otherwise, a splendid visit full of history and writing. Ash Lawn - Highland, the home of President James Monroe. 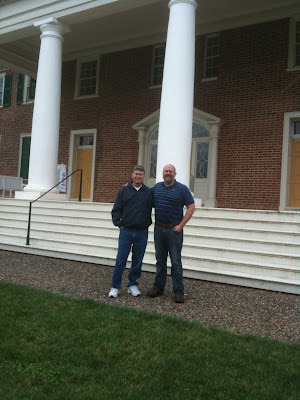 Dad and me at Montpelier, James Madison's home. Joe Samuel Starns has written a beautiful book called Fall Line, set in rural Georgia in 1955 on the day the floodgates for a new dam are closed to create a lake. This book is getting great reviews. The Atlanta Journal-Constitution says it is "a quiet dazzler of a new novel." Everyone should check this book out! Sam and I were on a panel with Casey Clabough, who has written a book called Confederado, about the Confederate families who, in the aftermath of the war, chose to move to Brazil. It is a fascinating and little known part of American history. The moderator for the panel was the writer Clifford Garstang, a great writer in addition to being a great moderator. 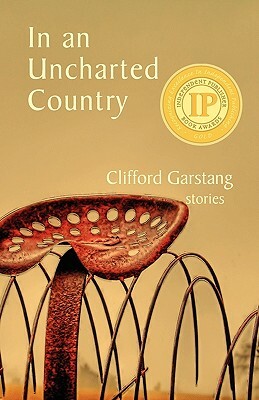 His award-winning collection of short stories, In an Uncharted Country, deals with the people in and around Rugglesville, Virginia. Another great read worth taking a look at! 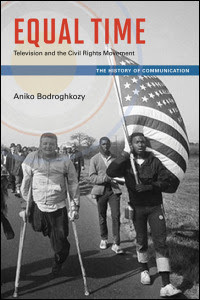 I also got to hear a fascinating panel with Aniko Bodroghkozy, whose book Equal Time focuses on the relationship between mass media and the Civil Rights struggle of the 1950s and 1960s. Her talk dealt with the way both black leaders of the Civil Rights movement and white segregationists used (and were used by) television news media. What an incredible topic! On the panel as well was Kelly Figueroa-Ray, who spoke about the launch of a new digital archive of Civil Rights-era material. This archive, called "The Civil Rights Movement as Theological Drama", collects interviews, photographs and other materials that reflect the divergent views of many different participants (e.g., KKK leaders, white ministers, black activists, etc.) on their role in the struggle using religion as a filter. It is an important collection of documents and I look forward to browsing through the archive and learning more. Back to the lambs. I got Clovis this lamb as a replacement for his much beloved and much grieved Lambie. There seemed to be some affection there. 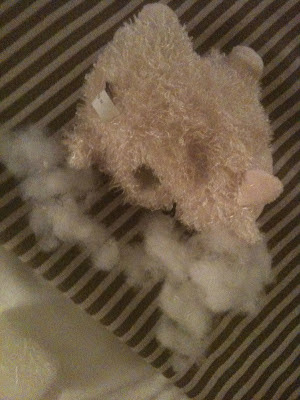 Then Clovis proceeded to disembowel the new lamb. Another Lambie bites the dust...ohhhhhh no!